If you’re not familiar with Violet Grey’s perfectly edited collection of skincare, hair products, makeup and more, this sampler is the best way to get to know L.A.’s hottest beauty destination. 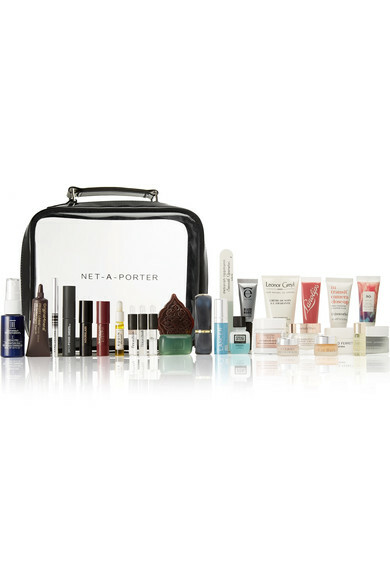 This pre-assembled set features 11 of the retailer’s best-sellers, including offerings from La Mer (yep! ), Tata Harper, Chantecaille, Lashfood, Shu Uemura and more. Oh, and it also comes gorgeously packaged and ready to give. Packed with seven investment-worthy beauty essentials that deliver big-payoff results, this collection is a gift any beauty maven would love to receive. From the ZIIP Beauty Nano Current Device and Dr. Sturm’s amazing Hyaluronic Acid Serum to a 111Skin Bio Cellulose Mask, Tatcha body scrub, Serge Lutens mascara and the famous Yves Durif brush (and more! ), this set has anyone covered from head to toe. As far as I’m concerned, a delivery from Net-A-Porter makes any of the day feel like a holiday—and I’d be thrilled to find this sample set under my tree (if I had one). You get 25 samples in a clear travel tote, and amongst the surprises are coveted products from Charlotte Tilbury, By Terry, Christophe Robin, Hourglass, Lancer and other swoon-inducing brands. I’m not dropping any hints here (OK, maybe I am) but I would be as naughty and/or as nice as my husband wanted for a really long time if Hanukkah Harry brought this to my house. With full-size Oribe shampoo and condition, a full set of Kevyn Aucoin brushes, a Kjaer Weis lipstick wardrobe, a Tom Dixon candle and enough super-charged anti-aging products to keep me looking 25 forever, just looking at the picture of this “Fantasy Gift” (check out the others, like a 12-month handbag subscription) almost makes me want to cry.